Concrete counters are ideal for homeowners who want something customizable, beautiful, and durable to complement their unique interior space. Unlike mass-produced countertops, DreamCrete can create something in an entirely personalized color, finish, texture, shape, size and edge as opposed to a generic manufactured appearance. With proper care, your bespoke concrete counter can last for decades and is as easy to clean as a standard laminated countertop. Whether indoors or out, concrete is a long-lasting and aesthetically pleasing choice for floors. Its surface can be finished in a number of ways through stains, colors, and aggregates or given an interesting texture or glossy buff that will wow both your family and visitors while improving the value of your home. Concrete isn’t just beautiful, it’s eco-friendly and does not deplete natural resources or energy. Its absorption of both warm and cool air minimizes the need for heating and cooling for year-round energy savings and efficiency. Remember that many types of concrete are naturally porous. So you’ll want a proper laminate on your surface to protect it from stains and everyday wear and tear. Generally speaking, you’ll want to use a pH-neutral cleaner and avoid aggressive scrubbing with pads and harsh cleaners that will wear away the laminate seal. Most of these products can be found at your local hardware store, Home Depot or Lowes. In a pinch, dishwashing liquid or gentle laundry detergent with warm water can also get the job done.  Of course, the professionals at DreamCrete are always happy to recommend our favorites as well.